For the majority of people, celebrations, parties, holiday treats, cookies and candy are all part of the holiday celebration. 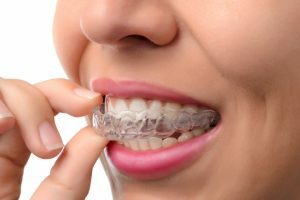 But for teens and adults in braces, it can be challenging to say the least. Invisalign gives a person the freedom to enjoy the holiday season and all of the things that come with it. It is also a time for laughter and lots of family photos. Is there someone in your family or special loved one who never smiles for the camera because they are embarrassed about their teeth and their smile? Invisalign is the perfect solution and the ideal way to show them you care. These aligner trays are made of smooth, comfortable and virtually invisible plastic that you wear over your teeth. They gradually and gently shift your teeth into place. There are no metal brackets to attach and no wires to tighten. You just pop in a new set of aligners approximately every two weeks, until your treatment is complete. You’ll achieve a great smile with little interference to your daily life. You remove the aligners during brushing and eating which makes it much easier to keep your teeth clean and allows you to eat all the foods you enjoy. So consider giving yourself or someone you love the gift of a beautiful smile for the Holidays. Dr. Gordon Honig is an Invisalign® Premier Provider for the State of Deleware. Contact our Middletown or Newark DE office today to schedule a complimentary initial consultation to determine if you are an Invisalign candidate. Keep smiling and Happy Holidays!